This ad invokes it all: total magical thinking. Those gullible enough not to be repulsed will nibble. This entry was posted on Wednesday, December 15th, 2010 at 5:00 am and is filed under Addictive qualities. You can follow any responses to this entry through the RSS 2.0 feed. You can leave a response, or trackback from your own site. Quiznos is the extreme example of what we deal with. As long as there are suckers the BS will continue. 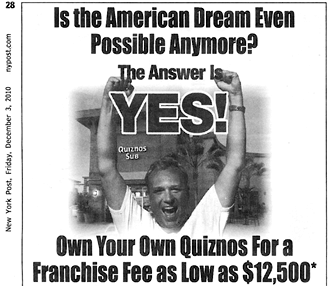 If there are investors in Quiznos then they get what they deserve. No brand is more con-taminated in any search than Quiznos. If Q wanted to pay me $200,000 to sign I would forge ‘L Stewart’ and run. Q is only the visible manifestation of extreme franchising. Would you rather go bankrupt in 12 months or 36? Just like natural selection in biology, the franchise industry is “stretching” their practices to narrow the opportunism gap. Straight out of the missile race of the cold war. You’re living in the land of Wally, Beav, Ward and June Cleaver. Ah yes; my comfort zone. We have a lot of Wallys here.